Many risks to critical infrastructure that are insignificant in 2017 will evolve and grow in 5 or more years. The U.S. Department of Homeland Security (DHS)/Office of Cyber and Infrastructure Analysis (OCIA) conducts net assessments to help Federal, State, and local decision makers understand these emerging risks and take action to prepare for the future. Autonomous vehicles are an emerging risk that will affect critical infrastructure. This study identifies and examines risks and issues likely to develop as autonomous vehicles become more common throughout the United States, and is intended to help decision makers mitigate potential consequences before they become significant problems. Autonomous vehicles fall into two classes: fully autonomous or semiautonomous. This report focuses on the consequences from the widespread adoption of fully and semiautonomous vehicles. 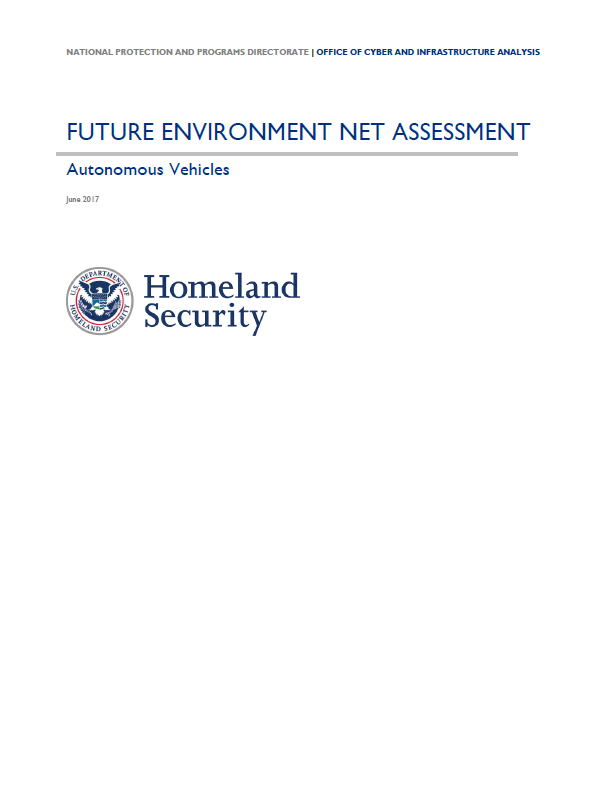 Further, this report ties in aspects of emerging technologies associated with autonomous vehicles, such as vehicle-to-vehicle (V2V) communication, vehicle-to-infrastructure (V21) communication, and intelligent transportation systems (ITS). ITS gather and use real-time data to inform automated decisions about the function of traffic-related infrastructure and hardware, such as traffic signals. Safety Concerns and Regulations Development: One of the strongest drivers for autonomous vehicle adoption is the vision of fundamental improvements in traffic safety and major reductions in deaths, injuries, and costs associated with motor vehicle collisions. Although many benefits exist, autonomous vehicles will not eliminate all collisions. Some states have proposed or enacted legislation to improve safety, including by requiring these vehicles to meet baseline technological standards. If states develop regulations independently, a variety of inconsistent laws, regulations, and standards might increase costs and uncertainties for vehicle manufacturers and operators, likely impeding autonomous vehicle development and adoption. Liability Across the Spectrum of Autonomy: Liability and related laws might need updating as vehicle autonomy increases and the level of driver engagement decreases. As of May 2017, laws regarding collision liability rest primarily with vehicle operators, but it is uncertain who will be liable as operators cede more control to vehicles. Liability is particularly complex for semiautonomous vehicles, which differ in their capabilities and require a driver to be engaged in some role. Laws and regulations in place in some states (or those under consideration) require autonomous technologies to automatically cede full control to human operators in an emergency. This raises concerns, because liability is not always clear for a collision occurring during this transfer. Autonomous vehicle development and adoption could slow depending on how these issues are settled. Cyber Risk in Autonomous Vehicles: Autonomous vehicles will have many positive benefits for society, but they also introduce new cybersecurity risks. Non-autonomous vehicles are already highly computerized, but components such as tire pressure sensors and braking systems were designed to function independently of each other and other vehicles. As components become more integrated and extend into external networks such as drivers’ smartphones and other connected devices, they will become more vulnerable and attractive to hackers. Risks include potential attacks against multiple vehicles at once and an increasing attack surface as more vehicle components become a part of the Internet of Things. A number of stakeholders are working to address autonomous vehicle vulnerabilities, including through improved collaboration among auto manufacturers and the Federal Government. Despite this trend, cybersecurity researchers, consumers, and others expect more progress from regulators and automakers. Workforce and Industry Displacement, and New Market Creation: Autonomous vehicles might have significant economic benefits among highly concentrated groups of businesses and industries, whereas industry disruption and job losses will produce negative effects spread across a large group of interests. Some industries, including shipping, transit, and technology, are likely to benefit from the growth of autonomous vehicles. However, these same benefits are likely to negatively affect the workforce; many professional drivers will likely lose their jobs, and by some estimates car purchases will drop by nearly two thirds by 2040, affecting auto manufacturers. Uncertainty exists about what new industries will develop and what existing industries will expand. For example, shipping industries might need fewer drivers for their trucks, but they will still need workers to load and unload trucks. Upfront Investment and Downstream Cost Savings: Autonomous vehicles will likely have many cost-saving benefits in the long term because of fewer collisions and reduced congestion. Vehicle collisions and traffic delays are expensive and cost Americans billions of dollars and hours of wasted time annually. Some stakeholders, however, might be discouraged from investing in autonomous vehicles and supporting technologies because of significant upfront costs. State and local governments, for example, will be key investors in ITS. Their investments will increase the cost savings and safety benefits of autonomous vehicles. However, they might have difficulty justifying spending significant taxpayer dollars on technology that will be beneficial only in the long term. Changes in Mobility and Urbanization: Autonomous vehicles that allow hands-free driving or provide wireless Internet might result in urban sprawl, widespread movement to suburbs, or both, if commuters realize increased productivity. Autonomous vehicles could also lead to an increase in productivity or new social engagement for populations that face barriers to driving, including people with disabilities and older adults. However, because different segments of the population are likely to adopt autonomous vehicles at different rates, regional, demographic, or other divides could occur. Changes to Physical Infrastructure Systems: By some estimates, car ownership will drop by more than one-third by 2040. A significant reduction in the number of vehicles within urban areas could lead to a decline in parking lots—a change that would not only affect physical infrastructure and aesthetics of cities, but also inspire economic growth. Additionally, the adoption of autonomous vehicles in urban areas could change the way planners integrate buildings into the surrounding environment. Many of the possible benefits will not be fully realized until a threshold of sufficient smart technology infrastructure is implemented, delaying the need for significant investment. Early planning will be important for decision makers to be able to make smart and timely investment prioritization decisions.